I want to try a different tactic. We know that money works to convince politicians to do things. Clearly calls, and emails and visits are not working on Senator Susan Collins. In fact, when I visited the Senate last to demand they vote against Trump’s Supreme Court Pick, Brett Kavanaugh, I was arrested. So what if we tried a new tactic — like kickstarter. 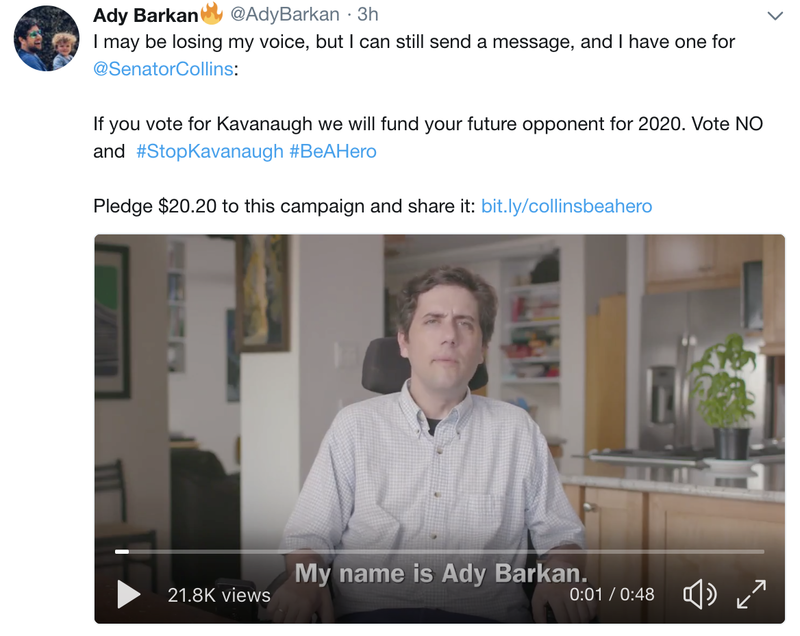 What if we pledge $20.20 to fund her future opponent IF she votes for Kavanaugh — like reverse bribery? Will you pledge $20.20 now? You will ONLY be charged if Susan Collins votes for the Supreme Court Pick. PledgeKavanaugh is a right-wing extremist who has challenged the constitutionality of the Affordable Care Act and wants to eliminate health care coverage for people with pre-existing conditions. For me, that means I’ll die sooner, and leave massive medical bills for my wife and son. If we don’t take action now — if we don’t speak out back against his nomination with an unequivocal voice and demand that our Senators do the same — Kavanaugh will be sitting on the Supreme Court before this year is over. If you vote for Kavanaugh, we will fund your future opponent for 2020. Can you pledge $20.20 to support this fund? Your card would only be charged if Senator Collins votes to confirm Kavanaugh. This is a crucial moment for our movement. Since they arrested me when I tried to share my story in the Senate, this is the only way I can think to reach them now. I hope you’ll join us. PS: Watch my video on this too, and be sure to retweet!